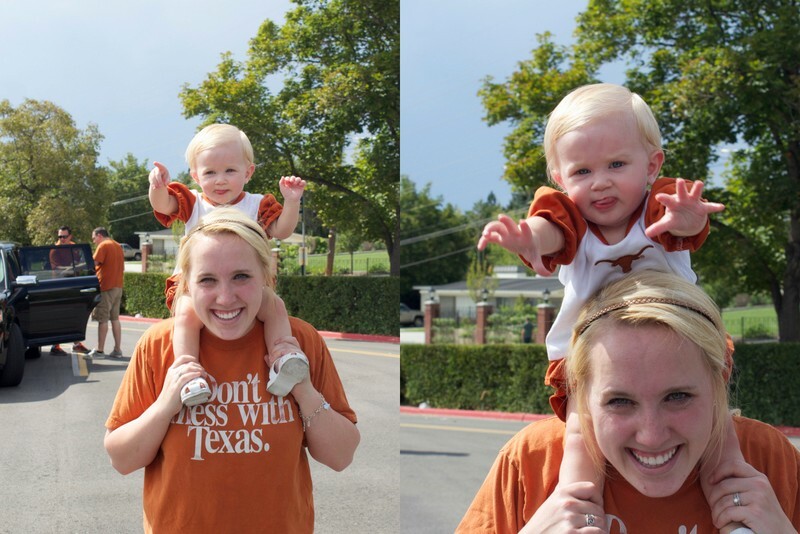 The Sunshine Space: Football season is here! 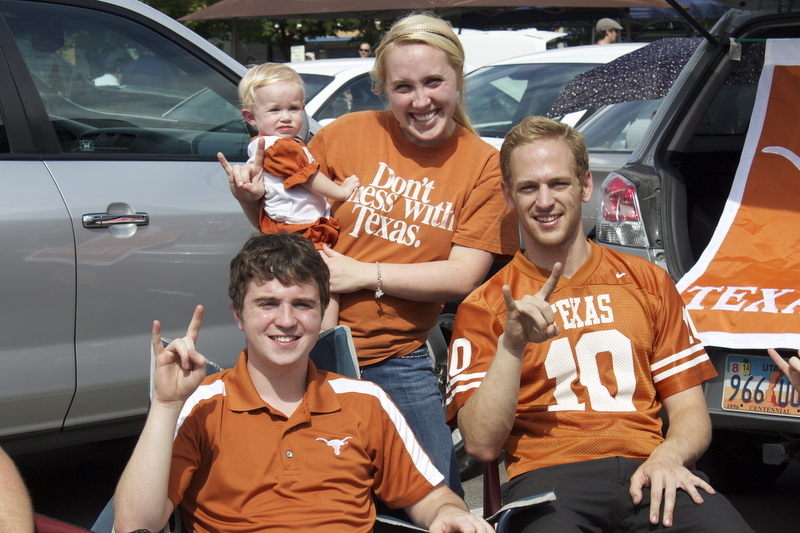 My cousins are full-blown Texas fans (like front-row-in-your-face-bleed-orange fans) and we had a great time tailgating with them before the game. They brought a huge speaker and played the Texas fight song, "The Eyes of Texas," and other country, Texas-y songs loud and proud. We Texans like to stick together and it was so fun to be a part of the "UT family." 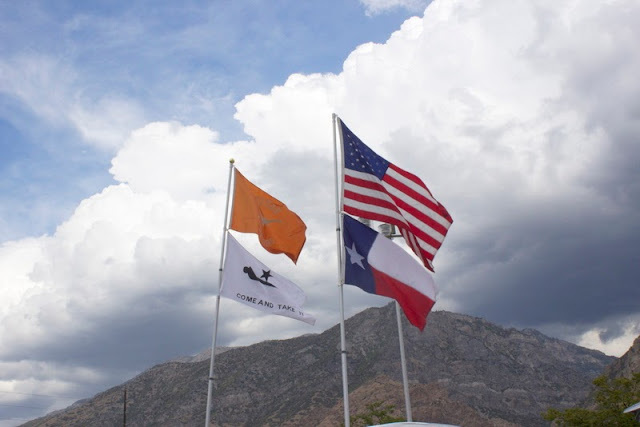 I loved these flags that some of the other tailgaters had up by their car. They made my heart happy! Well, as luck would have it, Provo experienced a major rainstorm right before kickoff and the game was postponed a few hours. Poor Lindsey got soaked and was miserable, but my little family got lucky and we were able to stay dry. Tenley slept through the storm as we took shelter under the stadium. 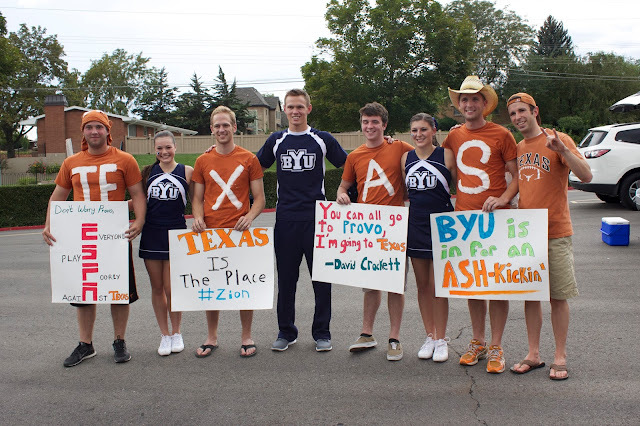 I couldn't convince JD to sport the Texas gear and he was decked out in BYU apparel. We got a few funny looks as we walked through the crowds together. In the end, BYU "hooked" the Horns in a major way. It was an exciting home opener for the Cougs and I was glad we stuck it out through the crazy weather. Although I was dressed like a Texas fan, I can't say I was disappointed with the outcome of the game ;) The Cougars rocked it. Here's hoping they can play like that against Utah!